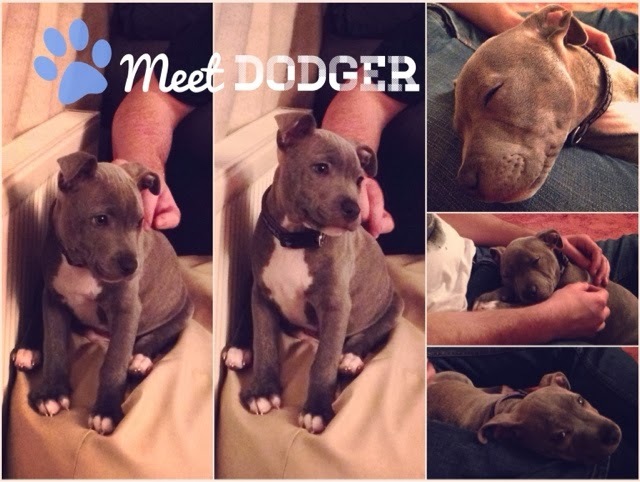 Meet Dodger, John and Family's cheeky little rascal Blue Staffordshire Bull! He's currently 12 weeks old and full of bounce! John had been thinking about getting a pup with his family for a long time, and after meeting this little fella online and then buying him on the spot, they bought him home and welcomed him to the family. He's a clevel little pup and within a week and a half knows how to sit, wait, give his paw and lay down. He's absolutely adorable, and though a feisty and energetic one, loves a cuddle now and then and his sausages on a string. I thought it would be nice to introduce you guys to him, as he may be making more than just one or two appearances on here from now on. He got over 60 likes overnight on Instagram so he's definitely made an impact there, beating my most liked photo in a matter of hours! Cheeky... Of course, I won't forget about my little Dolly pops back home! She's a lovely little thing, and I love her to pieces! I hope they could meet some day but my Dolls is scared of other dogs... Maybe! We will see! What do you think of the newest addition to the family!? Isn't he just the cutest?